Visit Kellee and Ricki at UnleashingReaders and Jen at Teach Mentor Texts to see what they've been reading, along with everyone else who post their favorites. The winner of the giveaway of Superlative Birds by Leslie Bulion is Vicki Wilke! If you are interested, I'm writing a poem a day for poetry month, posting a second post on the days that I share reviews. 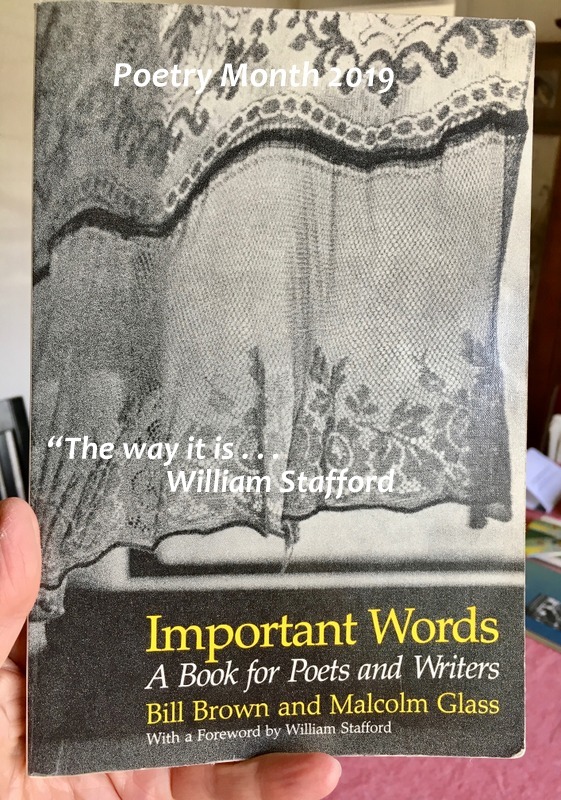 I've followed Laura's blog for a long time and have enjoyed her books and ideas for teaching poetry, too. Back in 2014, she wrote a poem a day for Poetry Month, I followed along and made a file of each, what she called, 'riddle-ku'. And I used them with students who loved writing their own. Now Laura has created a book of the seasons, just perfect for NOW because it starts with spring. Six riddles are included in each of the four seasons, beautifully clever new ways to see each part of our year and to crack the riddle. You'll need to get the book to discover the "wind bird", what has a "wicked whine", "a crispy crowd of loud crunch" and "knitted twins". 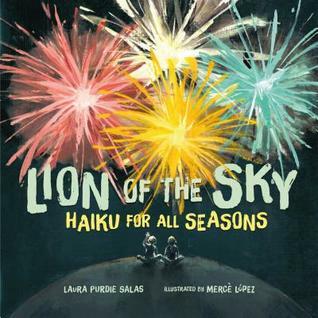 Mercè López illustrates with subtle hints in vivid color, manages to show each riddle with beauty, including that gorgeous title riddle, "lion of the sky". I love the varied things that Laura shows in the seasons, not simply in nature, but activities found in them, too. Laura explains Riddle-Ku in an afterword and a list for further reading is also added. Except for the book above, Thanks to Candlewick Press for the following books. It's time for babies! 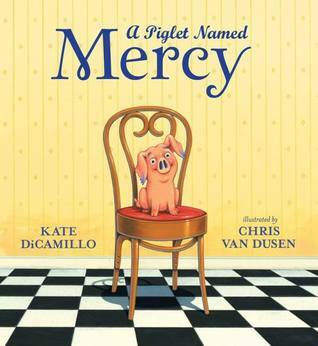 The origin of Mercy Watson is "extraordinary", and now we have the pleasure of learning it, and how those closest handled it. Mrs. Watson had just expressed concern to Mr. Watson about their ordinary life when Mercy appears. I won't tell the story because you have to read it and delight all over again at the Watson's immediate love for a baby pig, for Eugenia Lincoln's grumpy, no surprise, response, and for Baby Lincoln's good neighbor actions. Hearing the back story of Mercy and those in her life is a wonderful thing to read. Those who know best recommend that new parents and baby spend time to rest and to know their new family recently made, a time named "babymoon". In lovely rhyming couplets, ones that are like a lullaby, Hayley Barrett sweetly tells of 'sunny naps' and 'reading stories' along with bringing a chuckle when she writes "We muddle through each new concern. 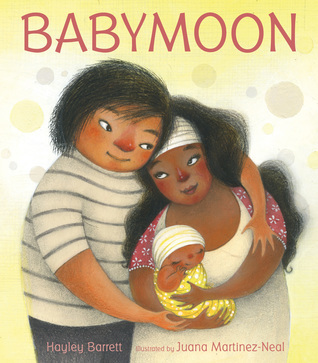 Focusing on the baby snuggling, sleeping, looking along with the parents' happiness and amazement Juana Martinez-Neal brings pages of warmth into her illustrations plus much emotion in the parents' faces. The focus is on their 'babymoon', but in the background are bits and pieces the home itself. A seemingly disgusted cat sits on top a shelf with other items that mean home--a plant and books, a figurine and a picture. Along the way, still loving the family, the cat appears curious, comes closer. A dog is part of the family, too, lying close, content. By the end, the family has settled in all together, happy in their babymoon. It is a wonderful book, perfect for a young or new family. 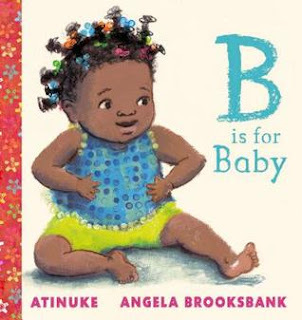 You might believe from the darling cover that this is an ABC book meant for babies, but no, Atinuke has crafted a baby book, but for only in this special story, the letter "B". Its a circular book, too, from Baby to Baba and back to Baba, then Baby again, and all the Beautiful Bounty one sees on a special trip. Don't miss Angela Brooksbank's gorgeous color illustrating this trip, favorites are the double-page spread with the baobab tree and the one where brother on his bike and baby in the banana basket ride by the Baboon. However, there is much to love on each page. I spent more than one part of a school year and then with trips with students studying sand hill cranes. 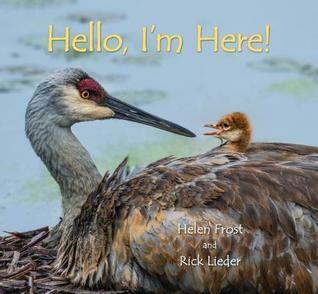 They, along with other cranes, are quite special birds as you will discover when you read this poem story by Helen Frost illustrated with incredibly marvelous photographs by Rick Lieder. From sounds in the egg, through hatching, and finally flying off with their flock, they follow one baby crane growing up. The story is told by the babies themselves as they accompany the photos, as in this picture below. And more information about sandhill cranes is added at the back. 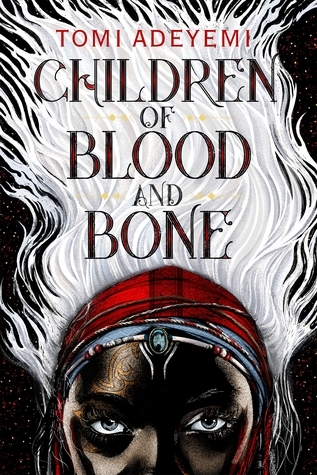 Still Reading: Children of Blood and Bone. I did not find the time to finish this busy week! Whew, it's intense! Writing about my recent weather. The winner of the giveaway of Superlative Birds by Leslie Bulion is, Ta Da, Vicki Wilke! Tabatha Yeatts has created a link to poems teachers and librarians can print for poetry month, titled "Poetry in The Halls". I'm grateful to be one of the poets! 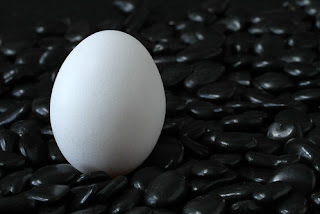 Jama Rattigan has a post HERE with many poets' goals for April. The Progressive Poem schedule can be found on the right. 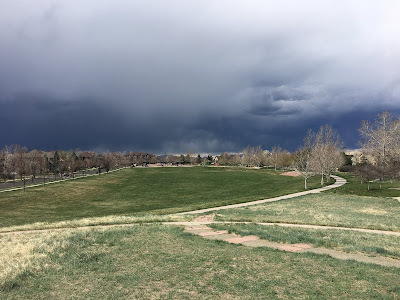 Last Thursday--predicted rain for Easter. and little ones hunting eggs in newly green grass. Windows opened. I wore shorts. We smelled summer’s perfumed air. but as predicted, the western skies darkened. 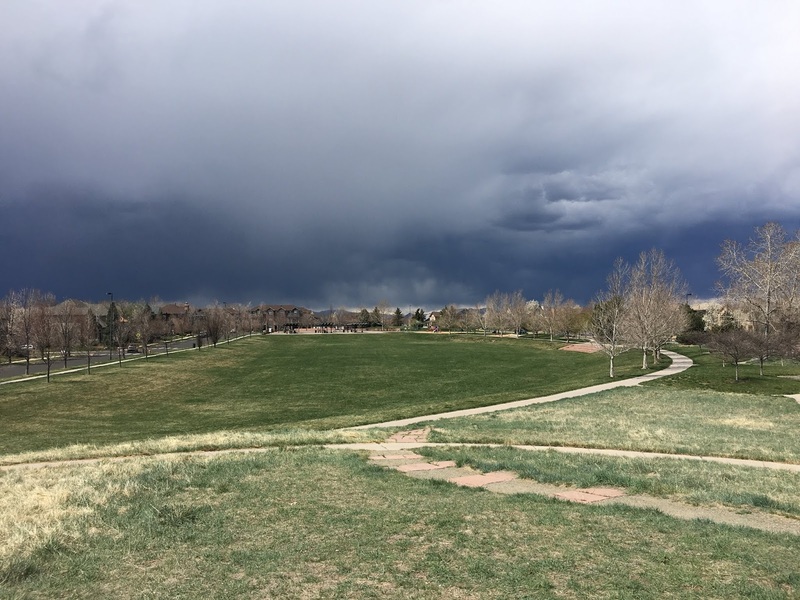 Rain clouds moved toward my side of the city. a few drops glistened on the lilies. I think I heard them take a sip. Yes, the prediction was correct. FYI - Others did receive lots of rain, just not us! Continuing with ideas from the past two posts! 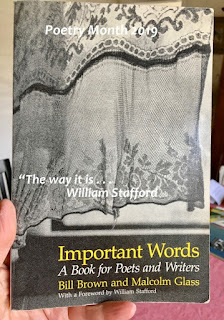 I have a giveaway of a new poetry book here. Be sure to enter! It's over tomorrow! The Progressive Poem schedule can be found on the right! It's Easter. If you celebrate, I wish you a joyous day today. And because it's Easter, I thought I'd write one more poem from my playing with words. Here is a brief piece from the History Channel that gives some history of the Easter symbols. A Giveaway Is Flying Your Way! Monday Reading - More Wow!